Consumers today are connected with brands 24 x 7 thanks to all mobile devices (phones, tablets, wearable, etc.) surrounding them. These mobile devices have also changed the way we interact with brands, consume information and shop. Increasingly more customers today use one or more mobile devices to shop and businesses must adapt to incorporate these devices in their marketing strategy. But, brands cannot see this platform in isolation and devise a strategy around it, neither can they use the strategy they use on other platforms as is. To completely harness the potential of constantly connected customers brands must offer a seamless and consistent experience across all channels customizing it to the needs of every channel. 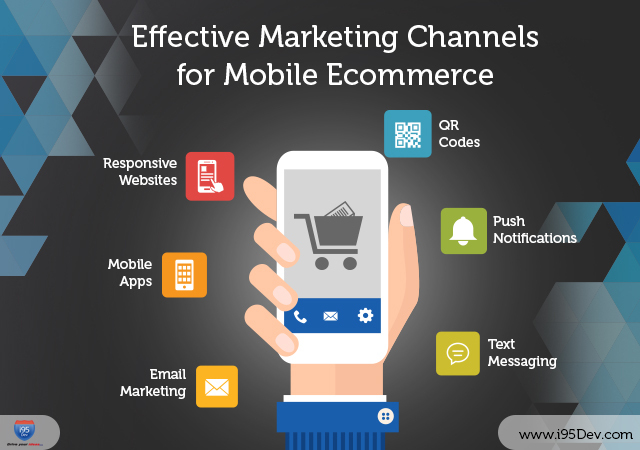 In the blog below we have highlighted few marketing channels that can work very well in increasing traffic and conversions through mobile devices. All these and many other stats point towards the importance of having a responsive website. The mobile optimized website adjusts easily to the visitor’s device, be it a smartphone or a tablet ensuring the same shopping experience across. With everyone talking about responsive websites it is very easy to assume that mobile applications are dead; but nothing can be farther from truth. A responsive website might allow your customers to make a purchase from the mobile device very easily but a mobile app can be used for much more. The application sits on the device and not only makes it easy for your customers to connect with your brand but can also be used to deliver deals and coupons to your customers effectively and much more. You have every reason to take up email marketing as a handy channel for mobile. Why? Because it is cost effective and can be very easily personalized. Mostly a sound, a badge, an onscreen alert or a combination of these things, push notifications are a great tool to reach new customers and connect to existing clients. Apps use push notifications to alert users of content updates, messages and many other things. Push notifications are highly useful as many analysts find this to be highly interactive and worthy of retaining customers. Best known as pixelated squares to customers, QR or Quick Read Codes are computer generated images that are seen attached to magazines, commercials, product packaging, on direct mails and many other marketing materials every day. These two dimensional barcodes when integrated into a campaign can be used to track user behaviors and to offer additional content or opportunities to the customers. You can even link customers to your page, exclusive boards or to product images pinned in your boards using QR codes. Plus, you can set up QR code in your store to lead visitors to your product and marketing videos for better customer experience. Considered traditional, text messaging is still a very effective marketing channel. Text messaging can be used by businesses when they have to reach a large audience for delivering deals or coupons, etc. According to a research conducted by Millward Brown 44% of consumers say that they would like brands to deliver deals and coupons to their mobile devices. According to another research SMS marketing coupons were found to be 10 times more effective than mail or newspaper coupons.